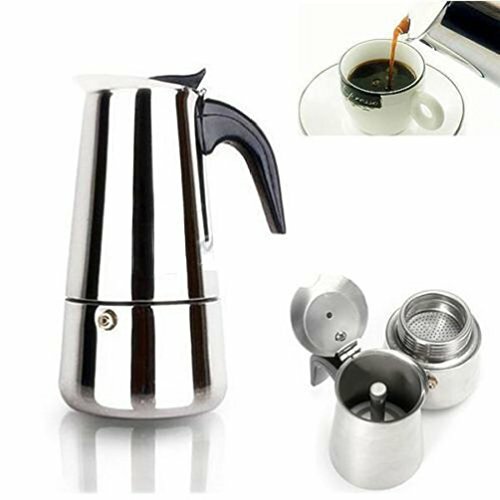 Made from stainless steel the coffee maker features a black plastic handle mesh filter metal rim holder and filter funnel. Suitable for use on gas and induction hobs.Simply add water and ground coffee and after 4-5 minutes on a hot hob you will have aromatic full flavour coffee the original Italian way.The coffee maker features pressure valves made with high quality stainless steel springs and ball bearings for safety and a new design stay-cool handle for comfortable use.The 9 Cup size has a capacity of 450ml.HOW TO USE1. Pour hot water into the cup not more than relief valves.2 Put coffee powder (2-3 gear proposed).Use chopsticks or spoon out the extra powder. 3. Screw on gate (need to tighten pressure to ensure don’t release ). 4. With gaslight or alcohol furnace heating fire not more than the base. If you use electromagnetism furnace heating it is recommended that you use about 600 watts.5. After coffee outturn into a small fire quickly. If you use electromagnetism furnace heating it is recommended that you turn the fire to about 200-400 watts of heat.6. Then slowly cook coffee.